Chesapeake Graphics is in the News! and their story reads like the quintessential American dream. 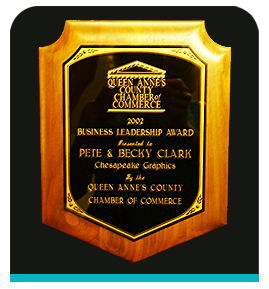 Chesapeake Graphics has built a solid reputation on personalized service, innovative thinking and diversification. The business offers embroidery, screen-printing and promotional items. Essentially, Chesapeake Graphics can put a name or logo on anything a business, school or team can think of, from T-shirts, hats, sweatshirts, sweatpants, seat cushions, banners, magnets, mugs, and even temporary tattoos. "We're a one-stop shop" explains Becky, "We have it all." Chesapeake Graphics maintains all the garment printing equipment in-house, such as commercial single and multi-head embroidery machines, so several garments can be specialized as easily as one. They also have manual and automatic screen-print presses, CAD cutter and heat prep, so they can handle dye-sublimation printing, a process that uses heat to transfer dye to items such as magnets, key chains, pencils, etc. The idea for the business came about when both Pete and Becky lost their jobs due to layoffs in the 90s. With finances getting tight, they decided it was time to take the risk or lose everything. Pete relied on his supervisory experience at a large print shop in Alexandria. Becky employed organizational skills she utilized in her career in insurance. Along the way, Pete realized there was much to learn, as screen-printing differs significantly from offset printing - the printing process used for magazines and periodicals. In both cases an artistic eye and attention to the tiniest detail is key, and soon hard work and perseverance paid off. Now a thriving business, Chesapeake Graphics is a member of the Advertising Specialty Institute (ASI), who provides award-winning products and services to the specialty advertising and promotional products industry. A small union shop, Chesapeake Graphics merged with Teamsters two years ago affiliating them with the Graphics Communications Conference International Brotherhood of Teamsters. Their largest national account, the National air Traffic Controllers Association, brings them business from various air traffic towers all over the country. This diversity allows them to cater to local businesses, schools and teams, like the Kent Island Lacrosse, and the Kent Island Boosters as well as many local unions. What differentiates Chesapeake Graphics from other ad specialties businesses is their commitment to providing excellent service for every customer, regardless of the size of their business. "We really try to give a lot of personalized, one-on-one service to our customers." explains Becky. "We spend time with them and treat everyone the same, whether it's a small order or a big order." Many times a client needs help deciding what products to order. Becky advises her customers to choose items that will produce the most exposure for their budget. With literally thousands of examples in their sample showroom, there is something for everyone. "We try to match the company with merchandise that will really represent what they do," she says. With articles often needed for special events, Becky is proud to say, they have never missed a deadline for providing promotional materials. Their commitment to customer service has earned Chesapeake Graphics awards and even recognition from President Bush. For more information call Chesapeake Graphics today!